Please see our Model BF-7010 which is a replacement for this product. 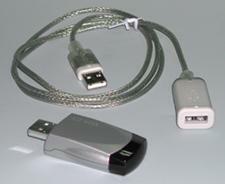 The Model BF-120 USB to IRDA converter, enables IRDA wireless data communication through a standard USB port. The device is powered from the USB port, so no power adapter is required. The effective data transmission distance is 0 to 1 meter. The viewing angle of the unit is 30 degrees. The BF-120 enables wireless data transfer between your PC and Notebook Computers, PDAs, Digital Cameras, Printers and other devices that feature IRDA data communications. The unit can be used on PCs running Windows 98, ME, XP and 2000.